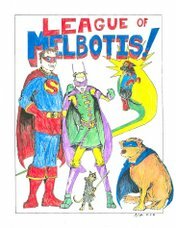 League of Melbotis: Whatever Happened to Bugs Bunny? 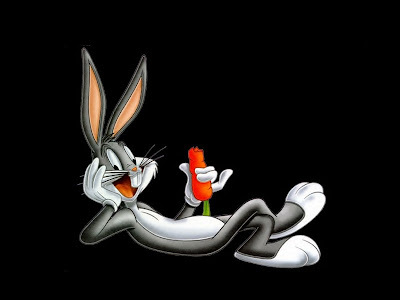 Do kids today have a concept of Bugs Bunny? I ask because, honestly, I don't know. I don't have kids. Several of you Leaguers do, in fact, have the small humans. A quick glance up and down the TV dial suggests Bugs not only lacks the exposure he once enjoyed, but that, really, he's not on TV at all. The once-ubiquitous trumpets (under the mad direction of Carl Stalling) declaring that it was time for another appearance of Merrie Melodies have been silenced. The concentric circles greeting you with a leisurely looking Bugs munching on a carrot have gone dark. Both have been replaced by 15 years of Power Rangers, 10 years of Pokemon and the decimation of the Saturday morning cartoon block in the wake of the removal of cereal advertisments for children. Not to mention the insertion of "safe" cartoons. Kids now get Rugrats, Dora, Blues Clues and other characters who tend not to shove dynamite down one another's trousers and who always learn a little lesson. Because Bugs was on each afternoon and on Saturday mornings, I was in high school before I quit taking Looney Tunes for granted and I realized how much I was a fan. Perhaps it was when Tiny Toons tried to emulate the old Bugs cartoons and came up short in pacing, in witticism, what have you... that I began to appreciate the madcap magic of I. Freleng, Bob Clampett, Chuck Jones and others brought to their long-eared alter-ego. Really... looking back... I think I based my entire relationship with The Admiral from 1988-2000 somewhere along the lines of the typical Bugs and Yosemite Sam cartoon. Me, the Admiral and the Admiral trying to get me to do chores. Circa 1990. Mickey Mouse pre-dated Bugs, showing up in 1928, but quickly dropped the wise-guy routine to play straight-man to his friends Donald, Goofy and Pluto. Mickey was your pal, and the rest got to to go off the rails a bit. Bugs, though, never decided to play it straight. He was our secret, private vengeance at the frustrations of dealing with life's insurmountable obstacles. Also, Bugs taught us the value of the big kiss and hasty retreat. Which actually works pretty well if you can get out of the room in time. Bugs remained somewhat vain, raised the stakes in any confrontation to absurd and unnecessary levels, and liked to honk out a tune despite the fact he was a bit tone deaf. Also, he had little sense of direction (he SHOULD have taken that left turn at Albuquerque). What wasn't to like, or even to identify with? Under the direction of I. Freleng he was hysterical. Under Chuck Jones... cartoons were never funnier. In the 80's, parents groups decided that Bugs, Wile E. Coyote and Foghorn Leghorn were antisocial and dangerous to kids. It was determined that we kids might take a cue from the cartoon animals on the screen and attempt to drop an anvil on someone. Or stick our fingers in the nozzle of a shotgun to watch the barrel explode in a hunter's face. Or, worse yet, give a manicure to a giant, orange-haired monster in tennis shoes. The argument did not make sense to me when I was 8. It has become no more clear in the ensuing decades. In the end, I suspect corporate conservatism ended up doing what the parents groups couldn't pull off. With Warner Bros. maintaining a legal stranglehold on the rights to Bugs and Co., the profits from cartoons as toy commercials became all the more appealing. Rainbow Bright was a 22 minute advertisement for a line of toys, as was GI Joe and Transformers. Bugs could maybe move a few stuffed animals, but... you couldn't move a Bugs Bunny fleet of spaceships. Add in WB wanting to make Bugs a vanilla mascot instead of the chaotic trickster he'd once been, and what good did it do WB to remind people that Bugs was usually a stinker? It is curious with two separate cable channels dedicated to cartoons and owned by Bugs' corporate proprietor that Bugs seems to get so little exposure. Short of the two feature films, both of questionable merit (Space Jam and Looney Tunes: Back in Action), Bugs has recently seemed more like a corporate schill. One wouldn't bat an eye to see the same rabbit who formerly was seen outrunning Hazel the Witch now acting as a pitchman for cell phones. Seeking to capitalize on the taste for action-adventure cartoons, WB attempted a sci-fi action adventure program with their Looney Tunes stars, Loonatics Unleashed. At least Paul Dini's "Duck Dodgers" revival was pretty funny. It's odd enough that WB seems unable to broadcast the decades' worth of Bugs cartoons. But the odder still that attempts to revive Bugs seem to fail. Perhaps its the shift in American animation from all-ages comedy to bloated features where celebrity voices are the only draw, or the fact that what animation does appear from domestic animation must be sanitized for the most nervous of parents groups, FCC overseers and WB standards and practices execs. Perhaps there was something to the old factory system of the WB cartoons. Or maybe the gifted and hilarious animators have moved on to their own projects, from "Foster's Home" to "Venture Bros.". After all, trying to convince the WB that they should use their corporate mascot to shove dynamite down a pirate's trousers probably seems like a professional dead end. In his own way, Bugs is the reminder that the little guy can always stick up for himself. That sometimes, in the face of imminent doom, a little zany chaos never hurt anybody. And it doesn't hurt to be smarter and one step ahead of the people trying to cook you up for their Sunday dinner. No doubt the cartoons kids are getting today are teaching them important lessons about self-esteem and the virtues of team work. And maybe Bugs' lessons on how to live a life free of constraint by way of cross-dressing and explosives isn't the message folks want their kids to pick up. I don't know. But I do know those cartoons aren't funny. Not remotely. I don't hear peels of laughter from Dora teaching kids the Spanish word for "mountain". A quick glance at IMDb suggests that Bugs is still working, but I'm not really sure if I've heard of any of these projects (aside from the cameo in the JL: New Frontier movie). If anyone knows where I can see any of these new projects, let me know. In the meantime, I need to start picking up more of the Looney Tunes Golden collections on DVD. I'm not sure what you people with kids do to ensure that they're getting the best of the best in their television viewing diets. I understand the gut desire to follow the parents' guide to nurturing healthy kids with non-offensive, focus group approved entertainment. And, hey... he was never really meant for little kids, anyway. Watcha few clips and see if you can't appreciate these cartoons all the more as an adult. Where are ya, Bugs? Some of us still love ya! It's funny you posted this because I had a similar conversation with the Mysterious M a few weeks ago about this very thing. I might have to find some DVDs of Merrie Melodies cartoons for Esmé when she gets a little older. RHPT, thanks for the link. I am glad that NPR and I are in agreement. Just an FYI: those Golden collections are on sale for 66% off or so right now at Amazon if you want to be ready for Esme's Looney Tunes viewing. Steanso said: Are you sure there's no Bugs Bunny around anywhere? Maybe someone needs to start a "classic cartoons" channel. That was, originally, the intention of Cartoon Network. And, when Cartoon Network decided to broadcast Dragon Ball Z 24/7 in the late 90's, that plan was dropped and Boomerang was born. Classic cartoons remain the intention of Boomerang. However, neither network broadcasts much in the way of Bugs. They haven't given me decent material since '57. "Anonymous," above, is an imposter. But he's right. This WB spokeshole gig of mine is a total drag. I step out from behind the logo, munch a carrot and, bam, I'm done. Call my driver and send me a check. The fact is, I haven't been handed a decent script in 30 years. Something's gotta be done, and I'm just the jerk to do it! I have to say, although its completely unpopulated, Bugs has the best name for a blog that I've ever seen. I plan to get started soon on that blog of mine, "OF COURSE YOU KNOW THIS MEANS WAR," but my keyboarding's a little slow -- may need to take off the gloves. Wow League you are spot on. Bugs has no place in the uber political correct world we now inhabit. As you said all the cartoons for young kids now are edutainment or half hour long commercials. As a father of a 3 year old girl I've spent a lot of time watching cartoons with her and while they are sometimes interesting they are never laugh out loud funny like Bugs used to be. I'm old enough to remember the original looney tunes before the censors got at them with their scissors and started cutting all the "objectional" material out of them. Man I would kill (not literally people, sheeesh!) to see an uncut version of "Duck Season, Rabbit Season" again. I really can't fathom how people think that kids will become confused and think that it is okay to stick dynamite down someones pants. Hell my daughters 3 and she knows that Barney is just a guy in a suit. I, for one, show my daughter bugs cartoons on youtube. I miss him.